Showing one of my favorite discontinued polishes some love today! Ruby Kisses is a brand often found at independent beauty supply stores for a reasonable price of around $1.99. They have a wide range of colors and finishes, and they apply and wear quite well. Blue Denim is a deep teal creme that was ahead of its time, because it was available long before teals became popular by today's standards. Two coats, high gloss finish, and fumes--what's not to love! 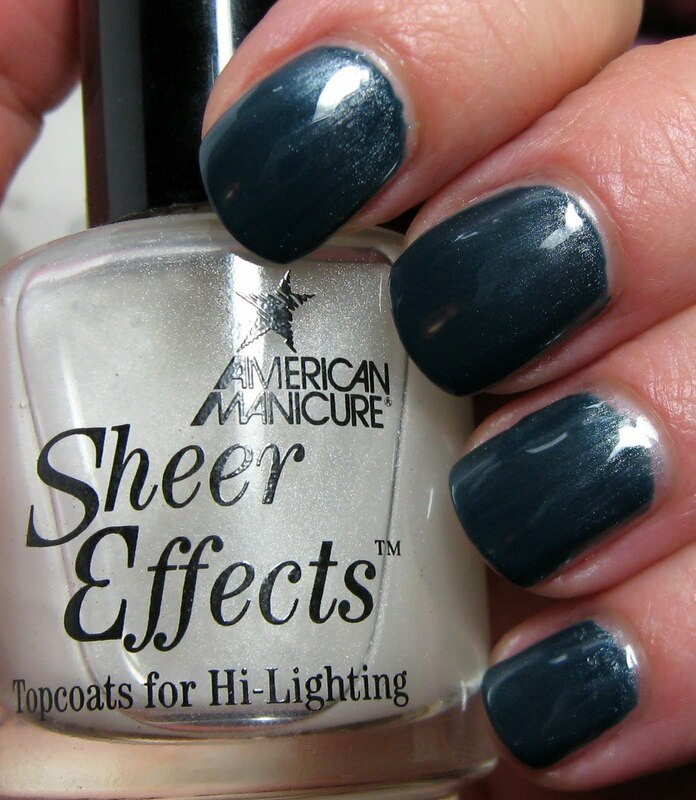 Below: This is Blue Denim topped with a coat of Bridal Veil ($3.95) from American Manicure. 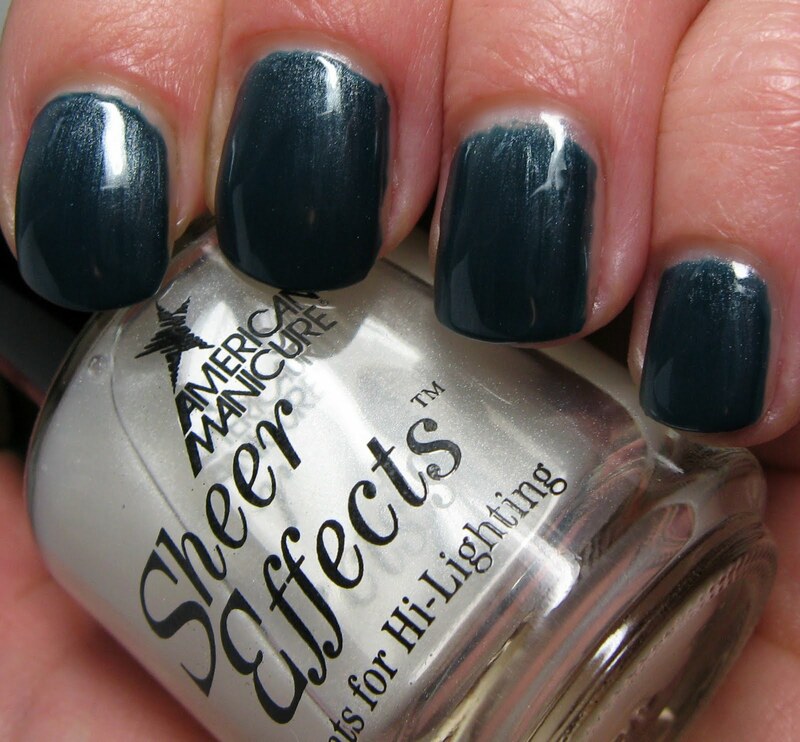 This top coat is readily available at VNS, which is where I bought mine. My local independent beauty supply carries a wide range of Ruby Kisses, and even though I keep checking for a Blue Denim back-up, I've yet to find one. The top coat is something I saw at VNS that I thought sounded interesting, so I also picked up the gold one called Gold Dust along with Bridal Veil. The description reads: Use these shimmering top coats to gently highlight your American Manicure. Sheer Effects are translucent and reflects softly colored accents in direct light. Today is the first time I've used Bridal Veil, and it is interesting! It adds a nice subtle effect, sort of a duo chrome with only one color--a mono chrome maybe?!! It seems to add a silvery shimmer that shifts on the nail so that the edges still look like the base color. a monochrome, totally! Haven't seen anything like that before! That's a really lovely shade of teal. Like that one. Hope I find this brand sometime. The company discontinued that colour? Why? Is it because it contains the Bad 3 ingredients found in older nail polishes? They could remake the newer polish and eliminate the bad 3 ingredients couldn't they? At any rate, it's a beautiful and gorgoeus polish and your nails never looked any more beautiful with this shade. Kudos on finding it and what a difference the mono-chrome top coat adds to it's beauty and shine. Very cool! i love that color, great for fall !! my leetle nails~ha-ha, I wasn't sure how else to describe it! I love it though and can't wait to try the gold one. Lolaa~glad you like it too! Lucy~check out little beauty supply.wig stores. Those are usually good places to find them. Stavroula~my guess is that at the time this was available, that particular shade didn't have a lot of demand so they stopped making it. I have no idea though, because we've seen plenty of popular shades disappear. Mc Huggs~I don't know whey they discontinued it, I'm sure they have to make way for new shades. But there are plenty of what I consider boring shades that they could discontinue instead!